The unique reinforced design of the SWS SeceuroGlide Excel has enabled it to become the first roller garage door of any kind to successfully complete independent testing recognised on a national level. A typical garage contains high value items, including tools that can be used to gain access to the remainder of your property. If proven protection for your car and home is a priority, then the SeceuroGlide Excel roller garage door is the perfect solution. For added security we an optional alarm can be fitted to your roller door. The door was tested by the LPCB who are the leading centre for loss prevention testing and approvals in UK. They are an independent test body used by the insurance industry. The Seceuroglide excel is approved by Police, Insurance companies, the Loss Prevention Council Board and Secure by Design. 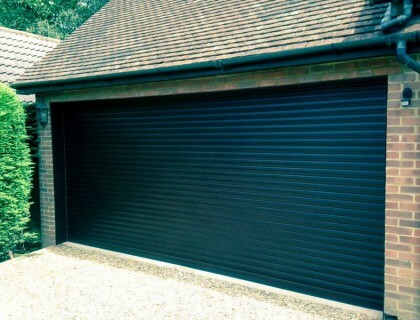 Are you interested in our Roller Garage Doors? The SeceuroGlide Excel is available in a choice of fifteen low-maintenance finishes and come supplied with a single channel SeceuroSmart receiver with built-in courtesy light, two key fob transmitters, a bottom slat safety sensor and an internal manual override. Digital Security – The SeceuroGlide receiver unit features rolling code technology, ensuring that each time the transmitted is used a unique control code is generated. This advanced security prevents any possibility of criminals ‘code grabbing’ using a radio scanner. Key fob transmitters enable the door to be operated without leaving the comfort and safety of your vehicle. Maximum Weather Protection – The SeceuroGlide rails are lined with a dense brush strip to block cold draughts and keep your garage warm and usable. A shaped rubber seal on the bottom slat adds further protection from adverse weather conditions. Full, half or no box – The garage door can be ordered with either a half, full or no box, its up to you. 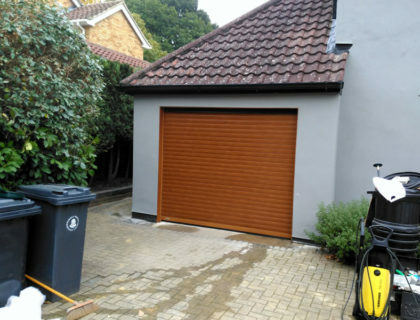 Manual Override – All roller garage doors are supplied with with a simple manual override crank, ensuring you will never be accidently locked in your garage – even in a power cut. Also available are external low-level override and battery backup options. Control Unit – The roller garage door utilises the tried and tested SeceuroSmart control unit, which combines a courtesy light with both remote and push button control functions. The unit is also available with an optional 90db alarm system. Patented Locking Mechanism – A self-adjusting locking mechanism is incorporated into the axle assembly.